Office has equations that you can readily insert into your documents. If the Office built-in equations don’t meet your needs, you can edit, change the existing equation, or write your own equation from scratch. Insider students and educators: We heard you loud and clear! your top requested LaTeX Math Equation syntax is here. Choose Insert > Equation and choose the equation you want from the gallery. 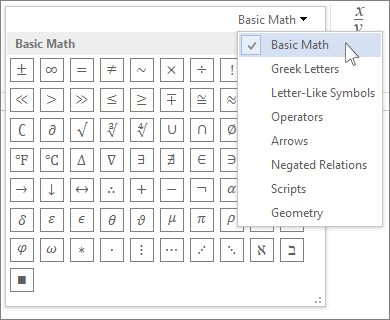 After you insert the equation the Equation Tools Design tab opens with symbols and structures that can be added to your equation. To type an equation from scratch, press Alt += on your keyboard. Choose Insert > Equation and select Insert New Equation from the bottom of the built in equation gallery. This inserts an equation placeholder where you can type your equation. Select the equation you want to add. Type a name for the equation in the Create New Building Block dialog. Select Equations in the gallery list. 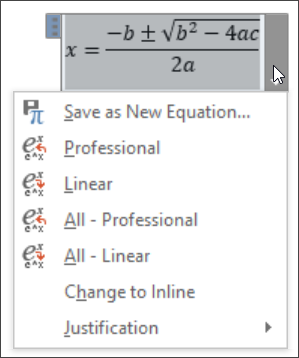 Select the equation to see Equation Tools in the ribbon. 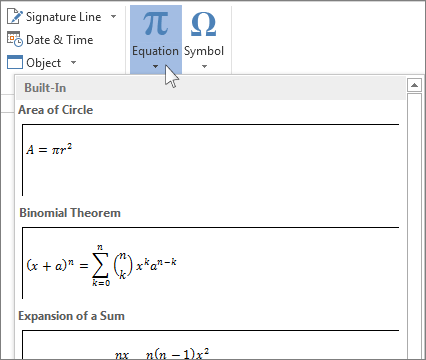 Note: If you don’t see the Equation Tools, the equation may have been created in an older version of Word. If so, see Change an equation that was written in a previous version of Word. Choose Design to see tools for adding various elements to your equation. You can add or change the following elements to your equation. In the Symbols group, you’ll find math related symbols. To see all the symbols, click the More button. To see other sets of symbols, click the arrow in the upper right corner of the gallery. The Structures group provides structures you can insert. Just choose a structure to insert it and then replace the placeholders, the small dotted-line boxes, with your own values. The Professional option displays the equation in a professional format optimized for display. 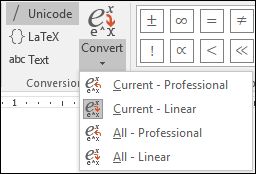 The Linear option displays the equation as source text, which can be used to make changes to the equation if needed. The linear option will display the equation in either UnicodeMath format, or LaTeX format, which can be set in the Conversions chunk. 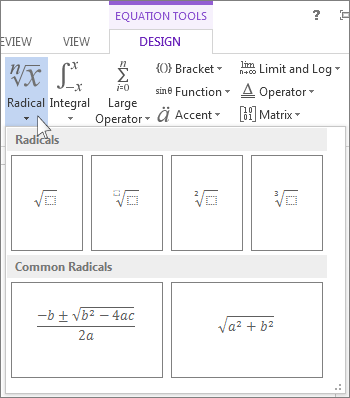 It is possible to convert all equations in a document to the Professional or Linear formats, or a single equation only, if the math zone is selected or the cursor is in the equation. 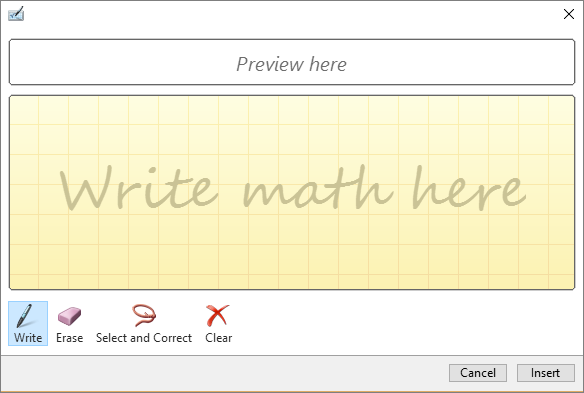 Choose Draw > Ink to Math Convert and then click Ink Equation at the bottom of the built in gallery. Use a stylus or your finger to write a math equation by hand. If you're not using a touch device, use your mouse to write out the equation. You can select portions of the equation and edit them as you go, and use the preview box to make sure Word is correctly interpreting your handwriting. When you're satisfied, click Insert to convert the ink equation to an equation in your document.